Um. WTF? So, I saw I’m Thinking of Ending Things at the book store. Sounded good. Bought it. Read it straight through. Listened to author Iain Red talk about it on CBC Radio. You were no help at all, by the way, Iain, so I am going to work on the premise that I know what happened. Kinda. Sorta. The journey also gives her an opportunity to catalogue her relationship with Jake. She mentions the way he chews, the toothpaste lingering on the corner of his mouth, his “jagged cheekbones.” The narrator comments that “Individually, we’re both unspectacular.” But that isn’t exactly true. When the narrator and Jake finally arrive at the family farm, it’s isolated and creepy. A tour of the outbuildings reveals dead lambs “Limp and lifeless, stacked up outside against the side of the barn.” They visit empty pigpens and the chicken coop before the narrator catches a glimpse of a “gaunt figure, standing, looking down at us.” Don’t go in that house is probably what you’re thinking. You wouldn’t be wrong because from this point on I’m Thinking of Ending Things takes a turn off awkward street onto sinister avenue. A surreptitious tour of the house reveals a basement that Jake had claimed was not used, but which the narrator reveals is “not true at all.” She discovers a disturbing painting and a bookshelf filled with pages and pages of equally disturbing drawings. And all this would be enough to make your skin crawl, but Reid’s novel is not nearly as straightforward as this. For instance, the narrator has been receiving strange phone calls from someone she refers to as “The Caller.” When she doesn’t answer, he leaves her strange, cryptic messages: “I feel a little crazy. I’m not lucid” says the first. The narrator also refers to a childhood memory of being watched through her bedroom window. Trying to figure out how these elements play into Reid’s narrative is half the fun of this puzzle of a book. Or half the frustration, depending on how you look at it. By the novel’s conclusion, I thought I’d figured out what was going on. I actually thought I’d figured it out by page 88. 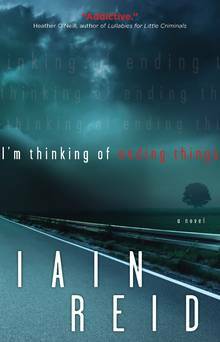 If I’m right, I’m Thinking of Ending Things is a trippy, creepy thriller that pushes lots of suspense-thriller boundaries. It also has something to say about identity and memory. Even if I’m not right – and we’ll never know because, hello – spoilers – it’s still a great book. This entry was posted in Book Chat and tagged 2016, Book Review, Canadian, highly recommended, psychological suspense by Christie. Bookmark the permalink.